Number your days and apply your heart unto wisdom. Is it not Socrates who said that unexamined life is not worth living. As humans, we ought to check our lives and give out the scorecards. So, join me as I take you down the memory lane as it concerns us. Stay with me. A Child was born, shouts of joy filled the air. It was on the first day of the 10th month in 1960. A double celebration it was, for a precious child was born on the day the most populous black nation got her independence. After 8 years, you graduated from primary school. At the government age of 18, you turned man and casted your first vote. The Politicians you voted for was unable to legislate a favourable law to support your education. You wasted some years, stayed idle in your father’s house, doing nothing as old age keep closing up on you. The cause was because of the numerous strikes that took place on the road to your graduation. Finally, you graduated as a political scientist at the age of 30, instead of 22. Now you needed to lie about your age because you need not tell the government you are 31, to avoid denying you of NYSC. After NYSC, you are greeted with joblessness. That marks the time of becoming a wanderer. You start wandering up and down in search of greener pastures, that will never come. Not even your fourth time of casting a vote could secure you a good job. Probably, you still feed out of your mother’s pot. At 34 still no job. You are unaware that you are your own problem. Continuously casting a vote that never produce the choice of the people is responsible for your unemployment. A rotten system producing criminals and looters. Think and do something differently. You managed to rent your own apartment in a jungle or do I say a slump and jungle, where all manners of evil committed. Suddenly, the politicians remember you. This time not for juicy jobs, but to do menial jobs for them. Erecting their signboards, pasting their campaign posters now becomes your only source of livelihood. Ignorantly, you read their posters saying: A vote for me is a vote for PROGRESS, EMPLOYMENT, SECURITY, JOB CREATION et al. That's when you still pay monthly levy for security you are not getting. Forgive me, but you are a fool. Your fifth time of voting earned you a job of pasting of posters. Or probably acting as Facebook influencer, lying to the people for the politicians and mortgaging your future. That's the progress and job they promised you. You voted yourself into living in a ghetto. A sophisticated moron you have become. Those you voted for are leaving in Banana Island, Maitama or Asokoro district in Abuja as gods. What an irony. At 42, you voted for the seventh time, yet unable to send your kids to School. The children of politicians are schooling in best schools abroad. They have first class personal Doctor's abroad, they leave in Highbrows in the country of their choice aboard. Your votes made them gods over you and your children. Same vote made you a pauper. As children of the voters are growing stronger as thugs, children of the politicians are groomed to be Governors, sometimes Ministers to man the affairs of children of the voters. You are a first-class imbecile and I don't need your forgiveness this time. At 46, your vote made you a ghetto chief. You have 3 kids living in a ghetto, hawking pure water for survival and out of school. As a ghetto chief you are well known by the politicians. They come once again with their deception. You put your 3 kids forward as political thugs. uneducated and without hope of better lives, they live a miserable life. Igbo ‘si na onye nna ya dunyere ohi na eji ukwu agbawa ụzọ’. So as sons of a chief political thug, they go out, fight and kill themselves for the politicians who made their lives miserable. Your foolishness is a special brand. Take award. At 50, a versatile idiot is better than you. Your 8 time of voting earned you a life of smoking and drinking all sorts of alcohol garnished with codeine and tramadol. That's what your votes earned you. As hopeless as your vote is, you are happy as a ghetto idiot. In your weak and poverty-stricken mind, you are very comfortable with codeine as only source of your happiness. Anytime you are caught by Nigeria authorities dealing on Tramadol and Codeine, the political devil that used your thuggish children to campaign for darkness and backwardness, releases you from prison. Stupidly, you go home with happiness, bragging to your neighbour's how connected you are. Papa ndi ghetto without future and hopes. At 54, your votes made the children of the politicians your senators. They sit three times a week, go home with over N9M. In a month, 12 times sitting. They smile to the bank with N37M, with juicy contracts and constituency projects that are non-existent yet they refuse to pay you N18K minimum wage not to talk of signing the new minimum wage of N27K and N30K for federal. This is happening all because of your stupidity. Your own son at age 30 is still pasting posters and erecting signposts in a ghetto, and you become angry when I call you multipurpose idiot and unthinking horde. 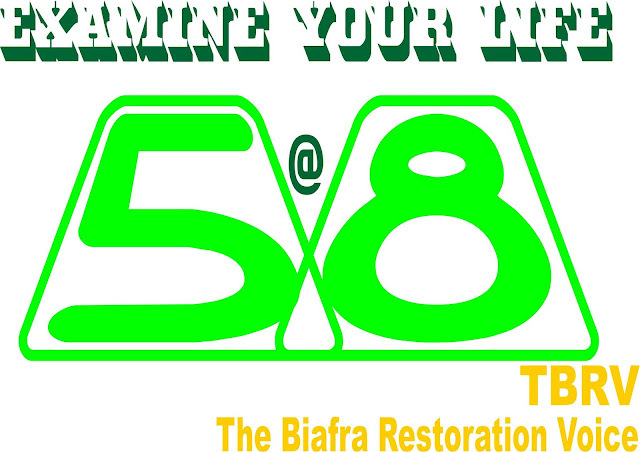 Conclusively, at 58 With your vote, you make Nigeria poverty headquarter of the world. In return, Nigeria made your life miserable, a hellish life of no redemption, all because of your votes. There are two choices before you on 16th February, 2019. A choice between LIGHT and DARKNESS. Both Atiku and Buhari are darkness. #SitAtHome, #BOYCOTT their evil (S)elections and renegotiate your miserable life. You cannot be contending foolishness with Nigeria at 58, and expect your life to be meaningful. Do something good for yourself. Secure the future of your children. Say no to that satanic structures that endangers your generation.